Today, I have something rather special to share with you. 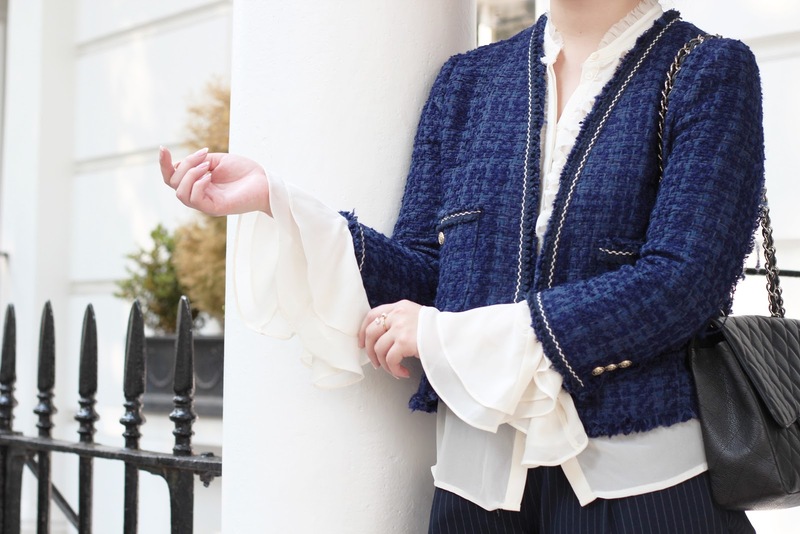 A couple of weeks ago, Links of London invited me down to their beautiful Kings Road store to style up and photograph some pieces from their summer collection, and of course I jumped at the chance! If you're unfamiliar with Links of London, let me amend that immediately; Links of London offer a classically contemporary collection of delicate, timeless jewellery that seems to perfectly tread the line between understated prettiness and eye-catching glamour. Everything seems to be simultaneously dedicate and statement - it's quite a feat! Of course, being the enthusiastic, shiny-object-collecting magpie that I am, delicate or statement, OTT or minimal - when it comes to anything jewellery related I'm all aboard. I thought the selection process would be easy peasy, but how wrong I was. With so many beautiful bracelets, earrings, watches and necklaces, I was the walking embodiment of spoilt for choice. 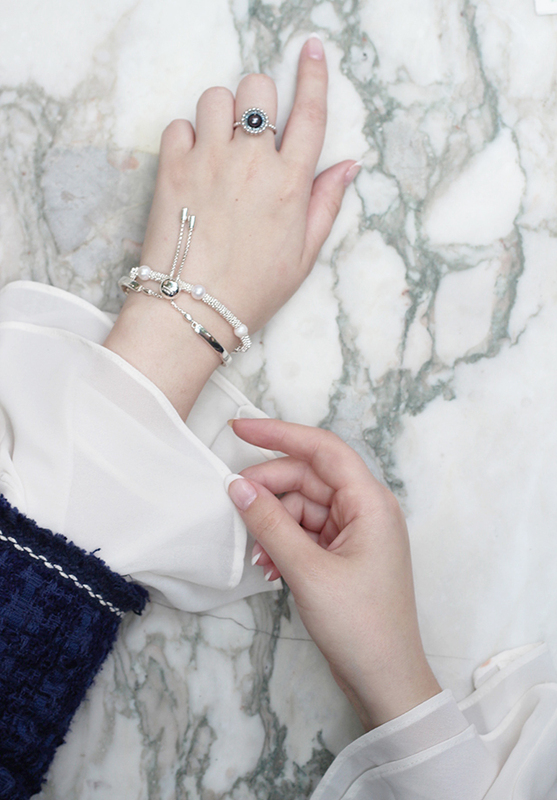 After oo-ing and ahh-ing at vast displays of imaginatively designed bracelets, I decided that because of the very intricate craftsmanship, I really wanted to keep all of the focus on one exquisitely adorned hand. So, I specifically chose 3 pieces that work beautifully as stand alone accessories, but also when worn in unison. First, I selected the Narrative Sterling Silver Bracelet. I felt this bracelet would look stylish and minimal when worn alone, but would also work very well in a stackable situation. A win win! It's a modern but classic looking bracelet, with an original clasp feature that is as decorative as it is integral to the design! Without this tassel like clasp, you wouldn't get the bracelet on, but simultaneously it's my absolute favourite detail. An important point I absolutely must touch on is the sturdiness of this piece. Matt, from Links, was helping me try on the bracelets and when it came to removing it he instructed me to 'pull' on the bead-like clasp. 'Really?!' I said, slightly horrified - assuming that nothing this delicate and pretty should ever be yanked. How wrong I was. After a firm but gentle pull, the bead clasp slides up and down the two tassel chains, adjusting the size of the bracelet. Amazing! Another important feature of this bracelet is the option to engrave it, meaning it makes a perfect gift and really heightens the sentimental value. Most people have names, dates or quotes - but I, not being able to remember the date my boyfriend and I actually met (sorry Charlie) opted to have my initial, 'A' engraved onto the bead clasp, and save the main surface area for when I actually had my facts straight. FYI, in store, hand engraving is £20 per name and £2 per letter after that, but machine engraving is available on the website and a little cheaper. I knew I wanted to choose three pieces that could all be worn together, so I decided to stick to a silver theme. 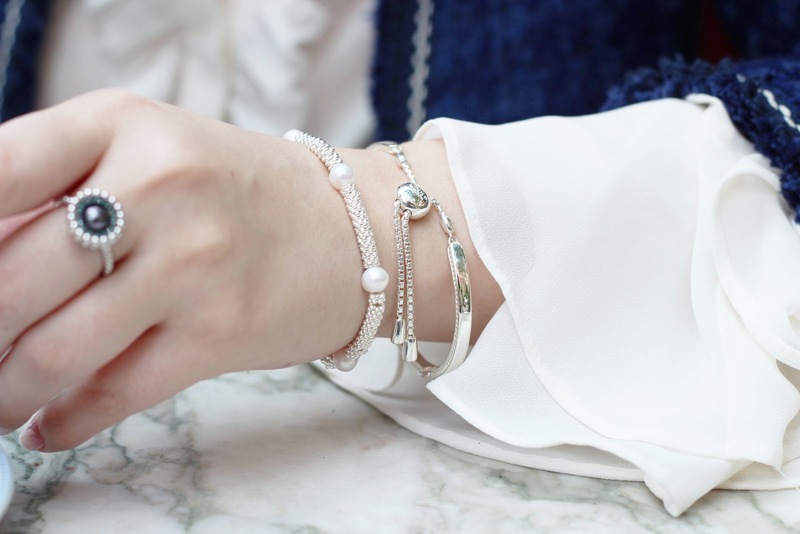 As soon as I spied The Effervescence Star XS Sterling Silver Pearl Bracelet, I was sold. 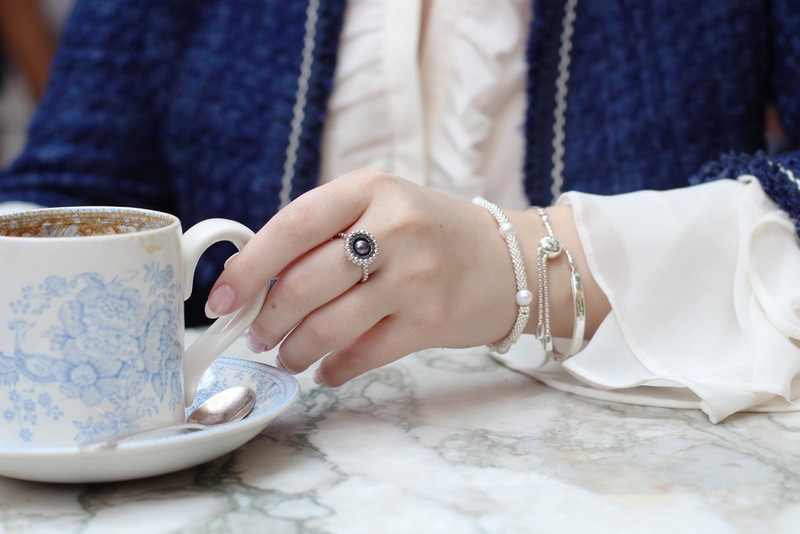 If you've read here before or watched my YouTube channel, you'll undoubtedly know that pearls are my absolute favourite addition to jewellery, and this one features cultured, freshwater pearls set amongst the design. This bracelet comes in a few different sizes, but I chose the smallest, daintiest size as I thought it'd work best for stacking with the Narrative Bracelet. This bracelet is from the Effervescenese Collection, which focuses on tiny beads inspired by champagne bubbles, interwoven together to make a larger structure. 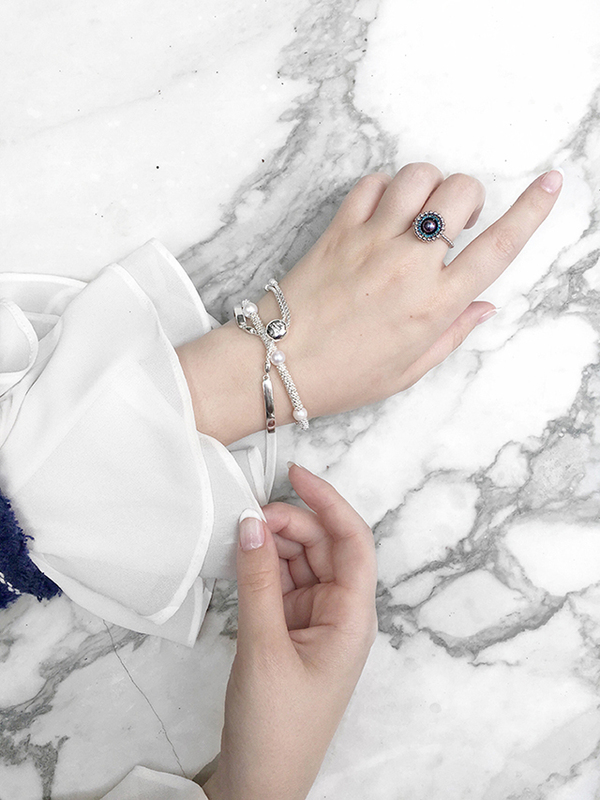 To top it all off, I selected the Effervescence Sterling Silver, Blue Diamond & Pearl Ring. Also from the Effervescence collection, this ring mirrored the bracelets tiny silver beads, which extend all the way around the diamonds and pearl central feature and under the finger. No detail has been spared - even the underside of the ring which isn't usually on show has received the same level of attention. I loved the midnight blue colour theme of this piece and I knew I had several items in my wardrobe that would compliment the shades perfectly. It's chunky enough to still make a statement, but still dainty enough to look elegant - worn alone or with jewellery companions! I've been so excited to share this post with you, so I really do hope you've enjoyed it. I'm so happy with the end result and I think the two bracelets and ring photographed beautifully. 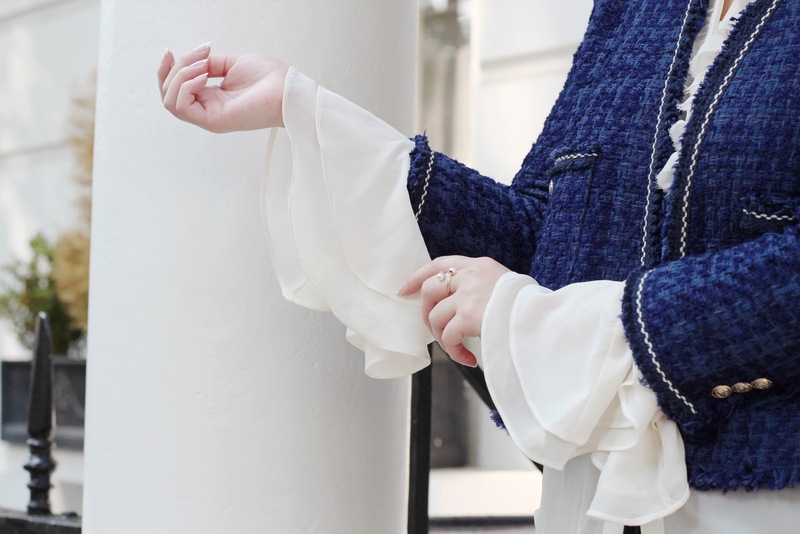 As a brand I've always admired, I was so thrilled when Links of London asked to collaborate. I adore my new pieces and I can't wait to style them with an array of outfits! I'm confident you'll be seeing a lot more of these pieces. Not only that, I'll also be attending a Links of London shopping event hosted by HELLO! Magazine (complete with Polaroid Photo Booth!) on Thursday 30 June, 5.30pm to 8pm at Links of London, 9 Kings Road, London SW3 4RP and you're welcome to come too! Admission is completely free and there’s no need to book beforehand. You'll be able to shop the collection with an exclusive 20% discount, all whilst experiencing a taste of summer with drinks from Belvoir Fruit Farms and champagne ice pops! So, if you fancy a spot of shopping or simply just want to come down and say hi (and maybe get in on the Photo Booth action) please do! Photos by Paige of Paige Joanna. Please note: this post is kindly sponsored by Links of London, but all item choices & opinions are brought to you by yours truly! Dressing 'Smartly' - Do Your School Uniform Rules Stay With You? Top: similar here. Trousers: similar here (I have these too!) Shoes: Russell & Bromley. Jacket: Zara. Sunglasses: Miu Miu. Bag: Chanel. Earrings: Dior. I read quite a funny article on Buzzfeed a few nights ago, all about American high schools and their rules regarding education-appropriate clothing; no racer back tops, no showing your collarbones, no 'unnecessarily' short skirts. Pardon me for my ignorance, but how short does a skirt have to be in order to be deemed 'unnecessarily' short? Answers on a postcard. It got me thinking about my school uniform. Are all of those rules somehow related to my subsequent love of tailored, smart looking clothing? I think back to myself aged 14; a fringe that resembled a helmet and a lot of very illegal eyeliner, but you better believe my shirt was done up to the correct button and my shoes were shiny. I occasionally attempted to bend the rules, but I always looked smart whilst doing so. I wonder if my penchant for such a look came from having uniform related rules banged into me since I was a small child? There's something about the tailored, put together, office-chic look that I'm just drawn to. I occasionally stray away in an attempt to look a little more 'edgy' but I always seem to fall back to it. I can't shake it. Perhaps its the ex boarding school pupil within me (fortunately, due to living down the road, I didn't have to actually board!). In fact, funny story intermission - on my very first day in the 6th form, when we were finally permitted to wear skirt suits instead of an actual uniform, I turned up in an outfit that (IMO) adhered to the rules, but was a little more... extravagant. The skirt was knee length with box pleats and probably 25% more voluminous than a standard suit skirt and the jacket was structured with shoulder pads and gold, military buttons. Basically I was a female Michael Jackson dressed for a very important business meeting. However, nothing about skirt volume, shoulder pads or button colour was in the rules. Obviously I appreciate that one can't turn up to school in a knee-length tutu and state 'well there was nothing about skirt volume in the rules', but I think as a 16/17 year old, you'd expect to be granted a little leeway to assert your individuality whilst also keeping to the rules. I was literally sent home to change into something more 'appropriate' and then had to walk in late to the first Headmasters Assembly of the year, in front of the entire school. May as well have had a judgy nun walking behind me, ringing a bell and proclaiming 'SHAME, SHAME' over and over a la Game of Thrones. So do these rules, even if we don't necessarily agree with them at the time, stick with us? I'm recalling these rules now and chuckling, but then I look down at my uncoloured, french manicure. My natural, dye free hair. I look towards my over worn, Dior pearl earrings and my wardrobe full of shirts, blouses and suit trousers and wonder if all of that has shaped my style as an adult. Did you have a uniform at school? If so, do you think you've unintentionally carried any of those rules with you into adulthood?